Attracting followers to your Pinterest profile affords you the opportunity to show them who you are and how you can help them. But you can quickly lose those potential customers if your content isn't consistently what they need. It's not hard to create boards of your product or service. If you are a photographer, you'll make boards for every type of photography you offer: weddings, seniors, families, etc. If you sell handmade jewelry, each type or style gets its own board: bracelets, rings, and necklaces or copper, gold and silver. But after that, what boards should you curate that will keep these new followers engaged? We've got a 3-step system that we use to choose new boards to create (and even old boards to delete or make secret). 1. Answer this question: What do my customers search for on Pinterest? As the owner of your business, you are the expert in your own customer. And most likely, pinners who stop by your profile and choose to follow you are similar to your existing customers (that's how you'll turn them from new followers into loyal customers–you already speak their language!). Let's use the photographer as an example again. We already know she is going to have boards for weddings, senior portraits, and family photos. But when someone is going to have a photo shoot, what else might they search? “Creative wedding poses,” “outdoor senior portraits,” and “what to wear for a family photo shoot” are all topics that someone in need of photography services might search. 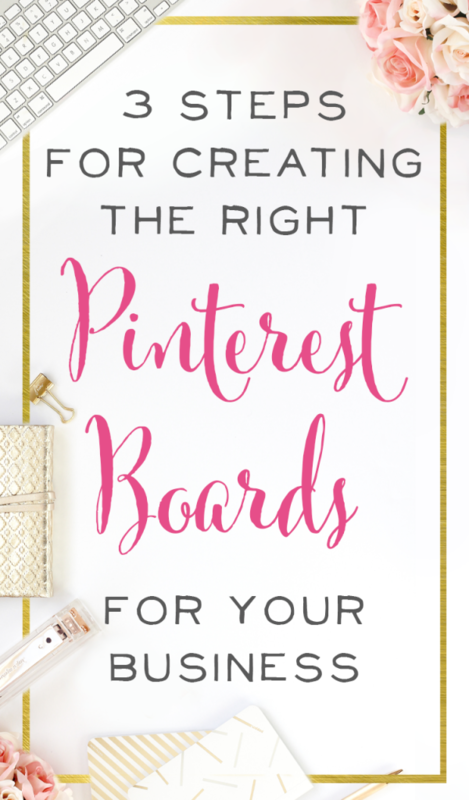 Creating boards based on what else your customers might search for will keep your Pinterest relevant and useful for your followers, old and new. Having some general boards is a great idea–they let people see quickly what you are all about. But there are hundreds or thousands of boards called Blogging, Photography, Silver Jewelry, and Healthy Living. So while you want those general boards that fit your business, you also need highly focused, incredibly specific board titles. We've done this recently for our own Pinterest. Our boards already included Blogging, but we've added Start a Blog. We had Photography Tips, now we've added Product Photography Styling. And we had Social Media Marketing, but now we have boards for Pinterest Marketing and Instagram Marketing. A photographer can get even more specific with boards like Pink and Gold Wedding, Country Wedding, Beach Wedding, or Formal Senior Portraits. Erica Mendenhall of Erica Mendenhall Photography has stocked her Pinterest with highly focused, specific boards that are filled with gorgeous, relevant pins. You want boards that will rank in those specific searches and that will make you stand out to your followers because you're providing the information they actually need. The smart feed means that Pinterest doesn't show everyone who follows you everything you pin. Instead, Pinterest chooses what to show people based on what they've pinned and repinned. Because of that, Pinterest prefers pinners who have a focus and stick to it, and whose pins follow a clear topic and are consistent. That's why you want to get more and more specific in your niche, instead of broadening your topics. 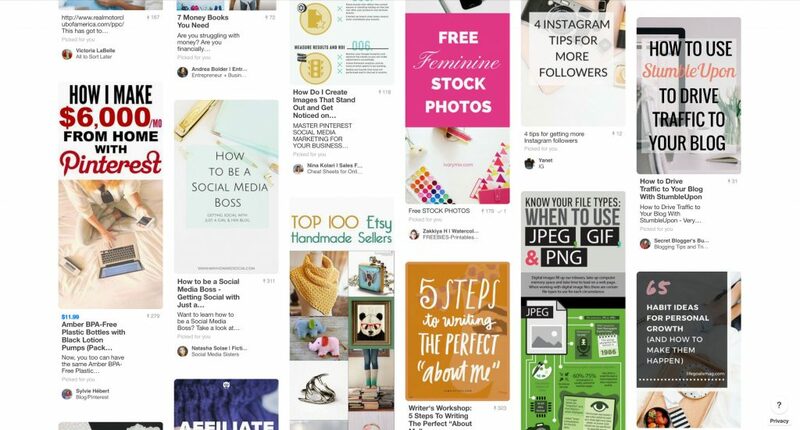 The closer to your niche and more specifically titled your boards are, the more the Pinterest smart feed can be confident of the subject of your pins, and the more likely it is to show your pins to others. Here's a snapshot of our Pinterest smart feed. It's clear: Pinterest shows us the same types of pins that we search for and pin regularly. We get this question often: “What if I have 2 businesses? Do I need 2 Pinterest accounts?” And the answer is…maybe. If you cannot connect the businesses clearly and logically, in a way that you can create mostly the same boards for both businesses, you should create a second account. Thinking like the Pinterest smart feed keeps you narrowly focused on the topics that your customers would want to see on Pinterest. That's it! It's not rocket science, but it takes focus, clarity, and a little investigation to choose the right boards for your specific shop or service and audience.